Former world No. 1 Novak Djokovic has revealed that he’s playing ‘pain-free’ ahead of this week’s ATP Masters event in Miami. The 12-time Grand Slam champion underwent an elbow surgery that forced him to retire midway from the Wimbledon last year. 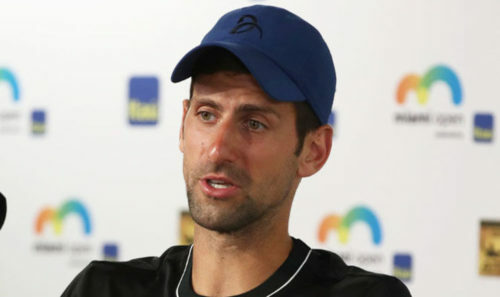 And although he has participated in a couple of tournaments this season (Australian Open and Indian Wells Masters), he is hoping to make a full-fledged comeback after being free of pain for the ‘first time in years’. “I actually started playing pain-free in the last two days. It’s quite refreshing because everything else had pain involved,” Djokovic told AFP (via Fox Sports Asia). “The last few days have been first in a long, long time that I could actually be focused on the game rather than have something in my mind and be worried about whether I am going to have pain or not. The 29-year-old, however, cautioned his fans of expectations, stating that he’s still not at his best. Djokovic has a bye in first round. He will have a tricky opponent in either Mischa Zverev or Benoit Paire in the second.